“I appreciate the willingness of Napa to innovate. I have been able to use Napa as an incubator to develop and refine improvements,” says Devarenne. “The innovation and standards here impact other competitions in California and elsewhere." If you’ve ever found yourself in a market overwhelmed by the selection of olive oils and unsure of the difference, you’re not alone. In fact, it might be fair to say that most consumers are more at a loss choosing olive oil than selecting a bottle of wine. 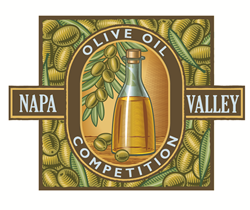 The Napa Valley Olive Oil Competition is looking to change that. Ringing in its 9th annual tasting this year, The Napa Valley Olive Oil Competition is aiming for an experience beyond your run-of-the-mill olive oil tasting. The competition is rooted in the belief that like any food experience, olive oil should be treated as a sensory experience. Alexandra Kicenik Devarenne is an international olive oil consultant and educator. A published author on many facets of olive oil, her biggest asset to the Napa Valley Olive Oil Competition is her expertise in quality assessment and quality control in the olive oil industry. Alexandra is the co-founder and CEO of Extra Virgin Alliance (EVA); an international trade association dedicated to olive oil quality. Working in both the trade and consumer space, EVA works to educate and inform the public about quality extra virgin olive oil producers to share the rich culture and uses for olive oil. While Napa Valley is most widely known for its winemaking, the olive oil industry has a boundless opportunity to be better recognized in the food culture. The greatest value in this competition is yet to be recognized. This competition also provides a unique opportunity for producers to receive feedback. Olive oil in the competitive space is much younger than the wine industry, with a different growth curve, though the judge-worthy criteria is similar. In fact, the things that contribute to high quality wine contributes to high quality olive oil as well. Coast influences and micro-climates (like found in Napa, Sonoma, and Paso Robles) all contribute to a higher quality product. The caliber of extra virgin olive oils being produced in California is gaining recognition and this competition strives to contribute to the high-quality standards in the industry. Over 100 oils have been successfully and professionally judged year over year with this number likely to grow. Entries for this year’s competition are open to all California Olive Oil producers. All classes are judged single blind by 9 trained olive oil judges. This panel is rigorously evaluated, and the group is calibrated prior to the tasting for consistency. Oils are judged on Intensity, Complexity, and Harmony on a 100-point scoring system. The goal is not only the sake of competition, but also to increase public awareness and knowledge of extra virgin olive oil. A direct-to-consumer showcasing of the 2019 award-winning olive oils are made available at upcoming events. Award-winning producers are invited to sample their oils to patrons of the County Fair & Fiesta (May 4-5) and at the Napa County Fair & Fireworks (July 4). At the conclusion of the judging, and after being on display at the County Fair & Fiesta May 3-5, the complete list of award winners will be available online http://www.CelebrateNapaValley.org Tuesday, May 7, 2019. For producers interested in competing, entry forms, lab report, and olive oil(s) must be received on or before 4 p.m., Wednesday, April 10, 2019. The judging will be held on Thursday, April 18, 2019. Access to the online application can be found at https://www.celebratenapavalley.org/NVOOC.